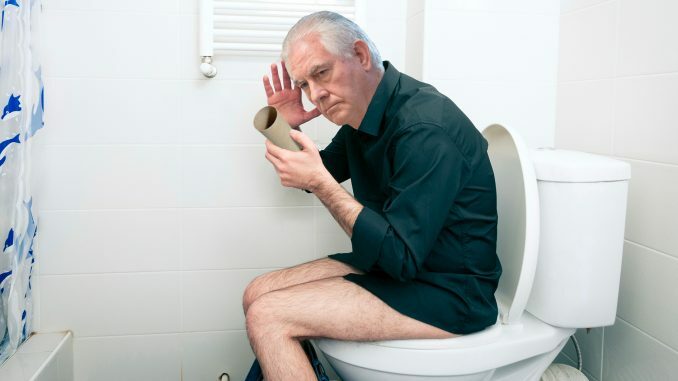 WASHINGTON, DC—There was more bad news in store for Rex Tillerson after he learned from Chief of Staff John Kelly that he was to be fired as Secretary of State while he was using the bathroom. The restroom he was using was out of toilet paper. This news was particularly unwelcome to Tillerson as he was suffering from a stomach bug contracted during a diplomatic tour of Africa. This ignominious voiding of yet another Trump official comes in the wake of Andrew McCabe, Gary Cohn, and Hope Hicks also being squeezed out, in what has become a giant dump of officials from the Trump administration. After leaving the restroom, a large overhead gull was reported to have given Tillerson some more bad news by relieving itself on his jacket.